A series of well known pictures have been taken at the French town of Beauvain. Here’s a little background information about these pictures. 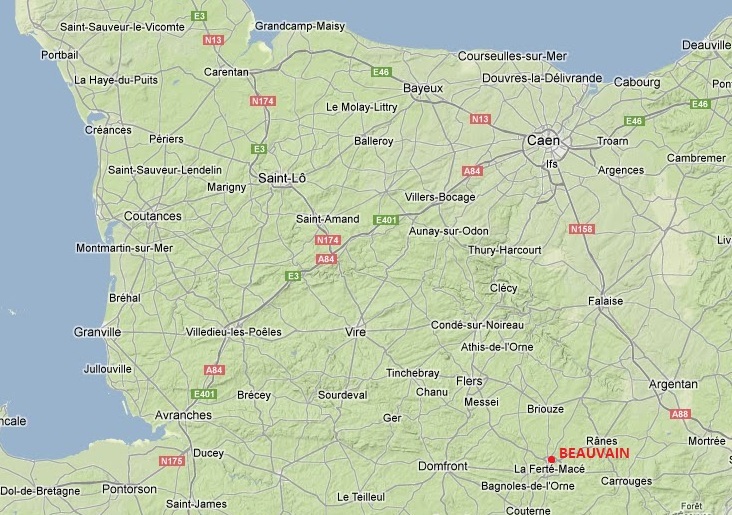 Location of Beauvain in France. 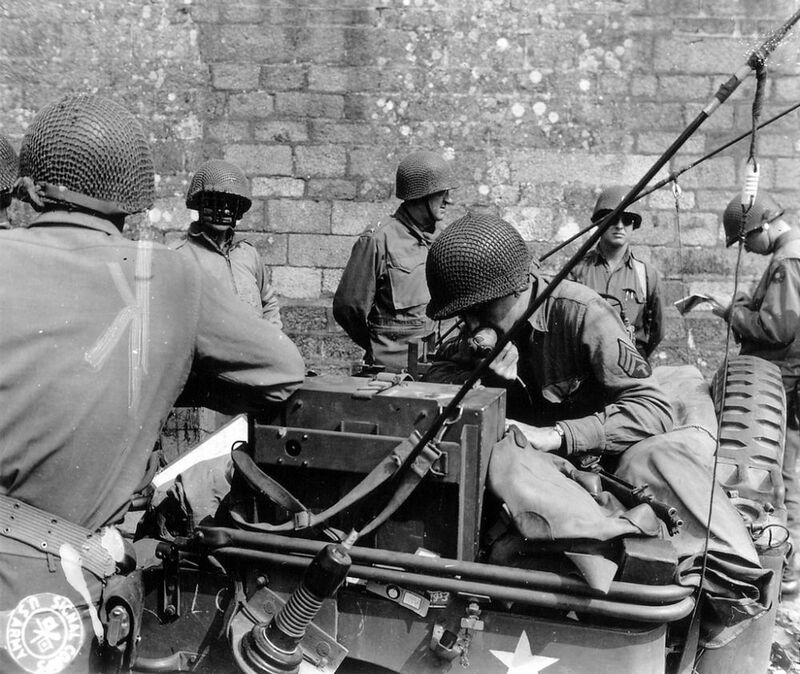 On August 15th, 1944, men of the 9th Infantry Division continued to advance through France. On this specific date, the 39th Infantry Regiment met no resistance until 6pm when light rifle fire came from the front, the direction of the town of Beauvain. Without hesitation the Regiment’s leading Batallions continued to advance. 2nd Battalion reached a branche of the Ferte streamline (west of Beauvain) and the 3rd Battalion pushed out about 1600 yards. In the 47th Infantry Regiment sector, 2nd and 3rd Battalions had to deal with strong enemy motor patrols to their front but managed to progress north against scattered resistance. Meanwhile, 1st Battalion of the 47th Regiment entrucked to crush the enemy at Beauvain. The men of the 9th Division were now closing in on the town, and engaged the enemy troops around it. As night fell on the 15th, the north and east sections of the town were secured. By 0800 hours the following morning, Beauvain had sucumbed to the 47th Infantry Regiment. General Manton Eddy and Lt Col. Clayman visited the town on August 16th, and on August 17th, a Command Post was set up about 1 mile south east of Beauvain. 1. A Beauvain street called Le Bourg. General Eddy can be seen studying a map on the left. 2. A close up of the same spot. 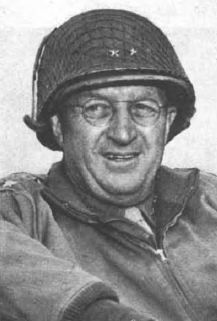 General Eddy is talking on the radio while studying the map. Note that the map has been censored for the picture. The man standing next to him is possibly the same man as seen standing on the left in picture 8. 3. 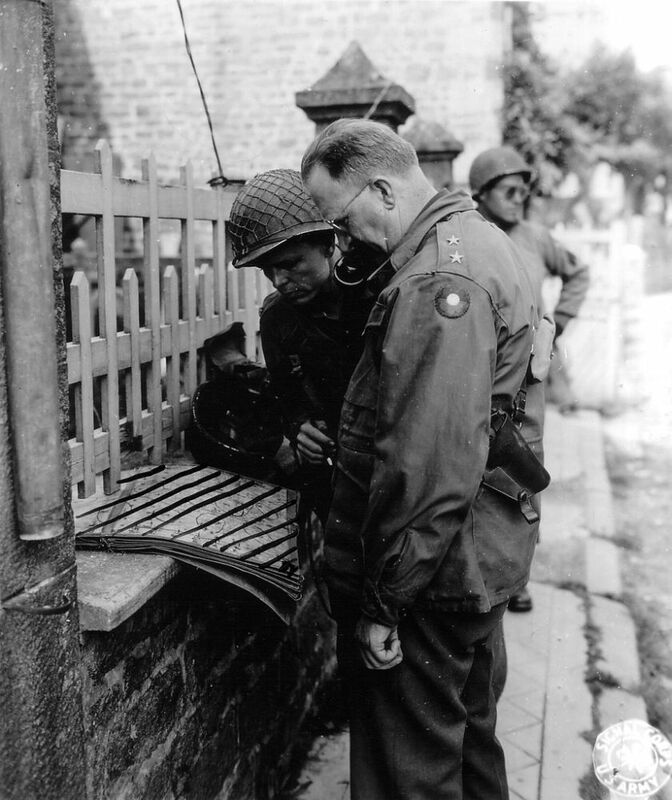 General Manton S. Eddy on the radio in Beauvain. 4. These 9th Infantry Division men awaiting local information in Beauvain, France. 5. 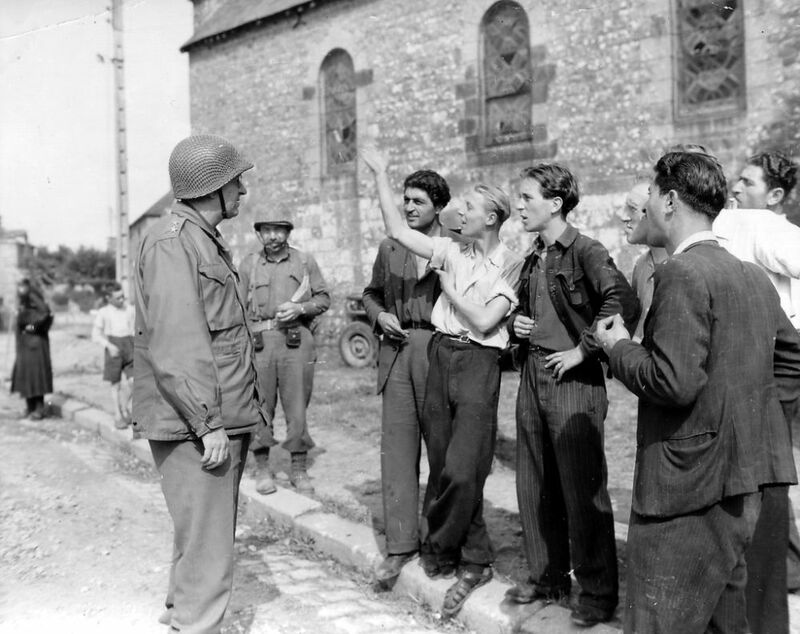 General Eddy, wearing an M43 jacket, talking to happy, liberated Frenchmen in front of the Saint Léonard Church. Lt. Colonel Donald C. Clayman is standing in the background. Note that he has two compass pockets attached to his belt! 6. Locals help out the men of the 9th Infantry Division any way they can. 7. General Manton S. Eddy standing in front of the Saint Léonard Church again. Note he is already wearing a M43 jacket here. Colonel George W. Smythe is standing next to General Eddy, wearing his sun glasses. His team of observers are working hard on the logistics and planning. 8. General Eddy at Beauvain in front of the Château de Beauvain. On the left an unknown soldier, possibly the same men standing next to the General in Picture 2. Then Colonel George W. Smythe wearing his sun glasses, and Lt. 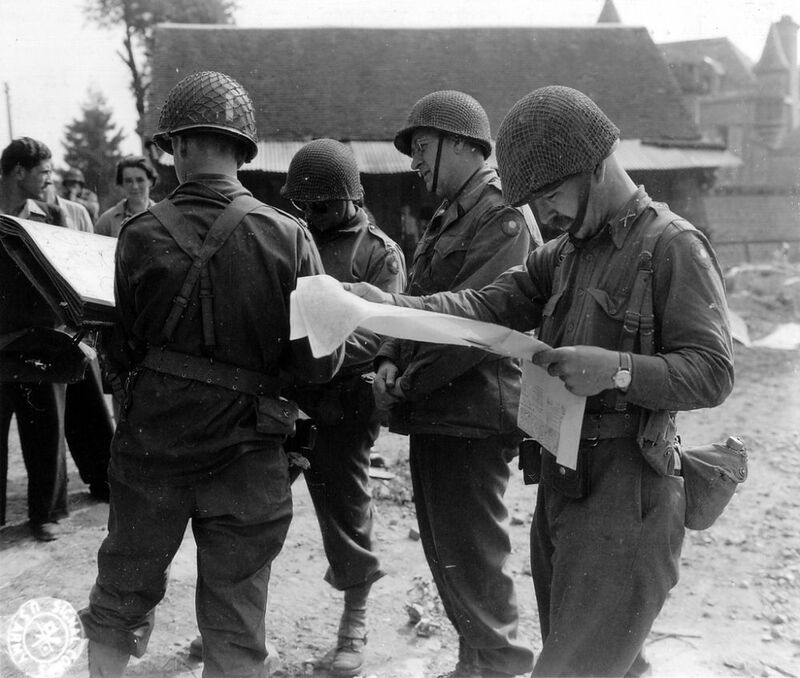 Colonel Donald C. Clayman is standing in the front on the right, studying the map. 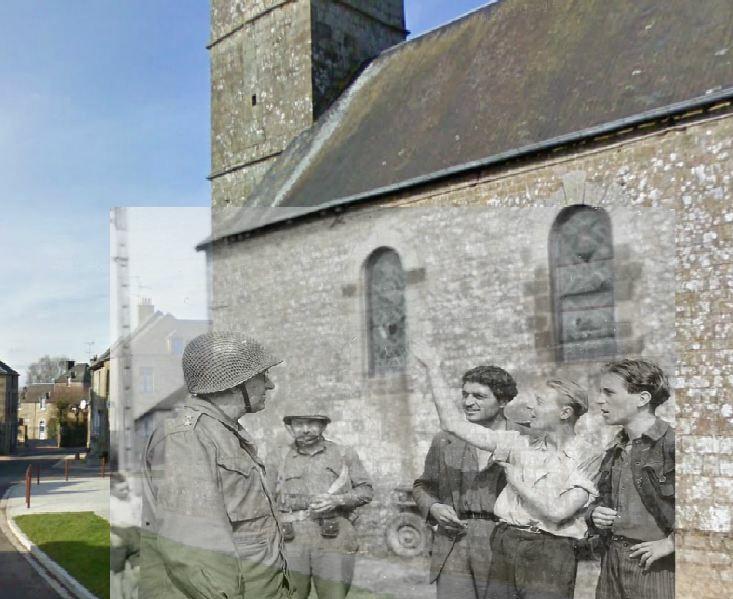 General Eddy in front of the Saint Léonard Church – Then and Now. Le Bourg street in Beauvain – Then and Now. 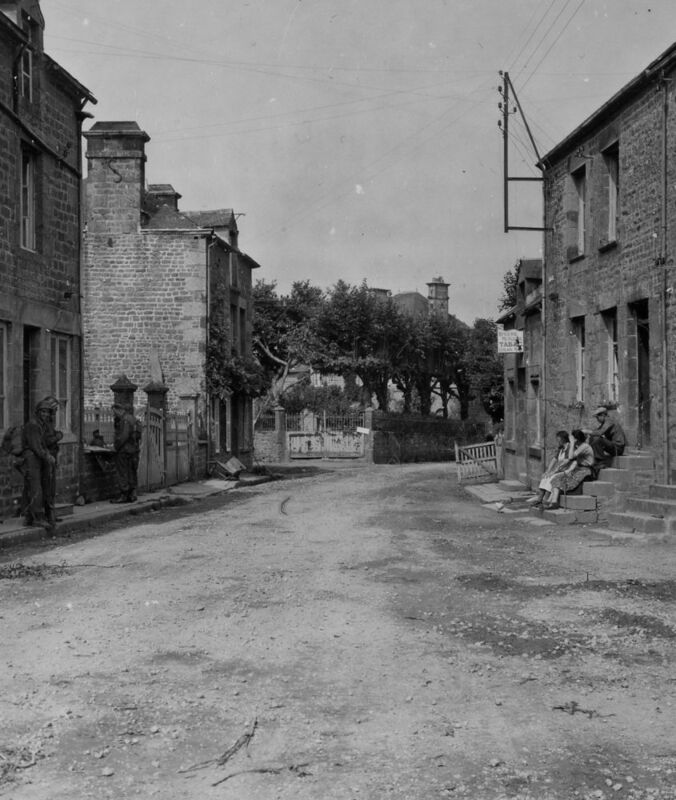 Le Bourg street in Beauvain – Then and Now. Closeup.